The European Union (EU) has warned Malawi Government that it will not resume its aid unless Parliament passes the Access to Information (ATI) bill. 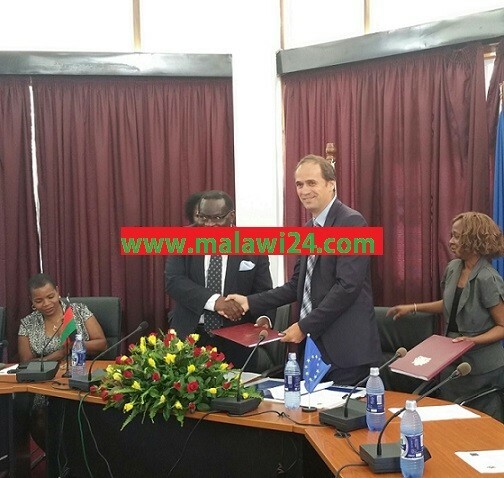 Speaking exclusively to Malawi24 on Sunday, EU head of delegation to Malawi, Marchel Gerrmann, insisted that his organisation is still not convinced with the transparency and accountability of Malawi Government. “We hope that access to information bill will help holding Malawi Government accountable thus without Parliament passing it into law, we will never donate to Malawi again,” said Gerrmann. This comes after the Malawi Government recently rejected the tabling of the bill in Parliament on the basis that it has some errors. However, the decision seems to have contradicted President Peter Mutharika’s promise that once voted into power the bill will be passed into law. But the international donor community including the World Bank said among other conditions, they will resume their donation once the bill is considered to be a law. Malawi24 understands that most donors gave government about 20 conditions to be followed if their donations are to be resumed. However, government has not yet achieved a single condition, according to reports. Donors were contributing 40 percent to the national budget each financial year but they cut their aid after learning that the aid was not being used for its intended purposes. This fate has since seen the country introducing zero aid budgets which most countrymen feel is widening the gap between the rich and the majority poor. The budget has seen government introducing heavy taxes on most indigenous goods and services including that of SMS and data (about 10%). Local media reports indicate that things are not going well in almost every government ministry. The ministry of health is reportedly in shambles as there are many problems rocking hospitals across the country. The ministry of agriculture has not been spared as there are as well many problems ranging from food insecurity and delays in distribution of subsidised farm inputs. In the ministry of education, government has seen a lot of problems such that recently, it just reasoned on hiking fees in secondary schools and universities as one way of raising funds to facilitate its zero aid budgets. Due to the same problem of inadequate funding, government is also failing to deploy about 10,000 primary school teachers it trained years ago. However, government seems to be confident that things will be fine in the near future without depending on donors. They do’nt want to pass the bill so that they should continue stealing.Aid or no Aid please pass the bill .We don’t want our little money to be stolen.Please God help poor Malawi. I dnt even like dis bushit EU, wht their doing is to play with our own motherland,do they think we can die without them. We have done without these so called Europeans.. go will remain with China. So many conditions for what? As much as I appreciate the importance of tabling this bill I don’t like the approach these guys take!! This is africa not europe preach about your homosexuallity to your fellow natives in Europe not in Africa. Go to hail with your unconditioned aid and we dont need to you aiding Malawi. We will continue surviving with the grace and the power of almighty GOD.GOD WILL PROVIDE AND MAKE IT POSSIBLE TO MEET WHAT WE NEED.GOD IS ABLE! They are partners in development who always to benefit from each and every aid they give to Malawi.. We dont need you to give us your silly conditioned aid.. Why cant you get a good example from China who always focus on their projects not so called Good Governance because they know that they are here to help the poorest of the poor. We became independent long time ago so please go away. If donors have vowed not to give aid to Malawi unless ATI is passed, then fine and good because GOD, JESUS CHRIST and HOLY SPIRIT are for us in such critical times of need. If you donors think you are important than God because you are rich, then the best way is for you to pack and go. Listen! Please just pack and go because we do not feel your presence in a country we are able to run our own affairs in the absence of your money. Have you ever wondered why China is massively assisting Malawi? You donors especially Britain and Germany – the Bible is there for us Malawians because what you can not give to Malawi, other countries can, and that is God. Stay with your money, God will be on our side and that is what Bingu (rip) and Mugabe had told you. Be to hell with ur aid!. God gives without conditions to everyone,the aid u are talking isn’t urs also but God being the owner.They say when giving let not the left hand what the right hand is giving.so take care,we Malawi lets unite to deny this dirty aid. Malawian be patriotic to ur country dont sell ur country to enimies like these as we sung in our national anthem always due to become rich indivisually. kodi anthu ofira khunguwa amafuna chani kuno? chithandizo chanu mukukaniza ndiye kumalawi kuno mukutaniko? osamapita kwanu bwaji? I’m talking about you pink-skined europeans! go to hell we don’t need your blood money! go to hell….funk you all stupid ueropeans….amatilimira si a ueropean union ayi…timadwa zathu, zausilu eti. Don’t worry, we are polishing it out. As far as the Western world passed the same bill as fast as you would like as to do it. Asanje and Snowden, what wrong did the commit? We wil survive without ur aid,dont bother urself we,re hard workers we wil make it and u wil see. what does ATI stand 4? I’m tired with the so called European Union. Malawi is in Africa not in Europe, so leave Malawi alone. Why can’t you give your aid to the poor Europeans? No ATI, No Aid, No What……….? Mukananenanso Kuti No Life, Ndikanati Ndinu Madolo, Koma Nthawi Yakutherani Mukufuna Akatiweruzire Limodzi Ana A Njoka Inu. How many lives survive through it except for those on high rankings that usually end up fixing it into their bank accounts? Even If you don’t give your aid then u think our Rightious God can leave us alone?? Well done the EU and World Bank. that’s the right move. No Aid resumption to Malawi Govt. without tabling the [ ATI] bill. We need to vigilant with these DPP -led govts, they always act in their Mafia- like styles in everything. fooling others. To them, the have nothing to do with what our Constituion stipulates. SAKUNAMA SANGATITHANDIZEDI KUBA KOPANDANAKO MANYANZI. Ndife osauka koma osangalala ndi mtendere wathu. kathandizeni ku Syria, Turkey, komanso those homeless.